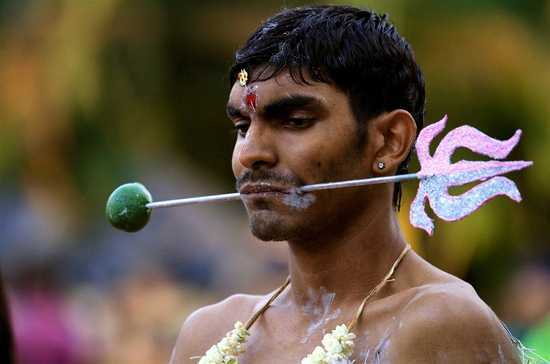 Not for the faint of heart, this Hindu festival is typically celebrated in southern India and involves some of the most intense body piercings known to man. According to practitioners, the more pain you can endure, the more you will be blessed and some even try pulling tractors or other heavy objects with the hooks in their skin. 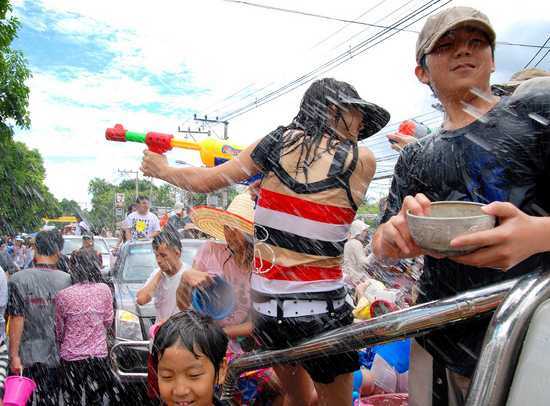 Every April, to celebrate New Year, the world’s largest water gun fight takes place in the country of Thailand. And no, it’s not just some small isolated village. We’re talking about an entire country drowning itself with super soakers. But the fun isn’t limited to water guns, as some people prefer buckets or even elephants. 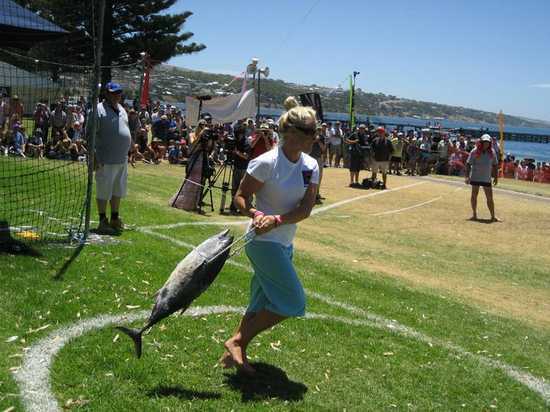 Originally meant to promote Australia’s fledling tuna industry, this festival has now come to be known for it’s highlight event - the tuna toss. 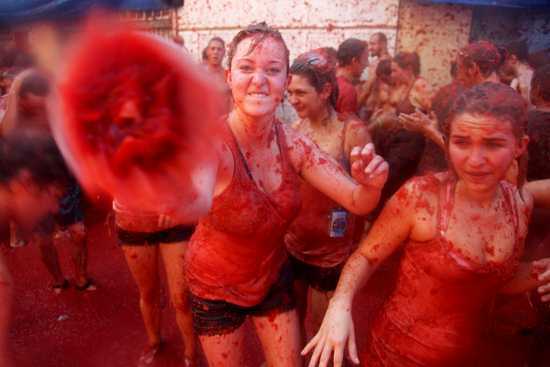 What started as something of a street fight between teenagers using tomatoes from nearby vegetable stalls has turned into the largest tomato fight in the world. It happens every year in the small Spanish town of Bunyol and over the course of about 1 hour the town gets so covered in tomatos that the fire department has to come in and spray everything down. 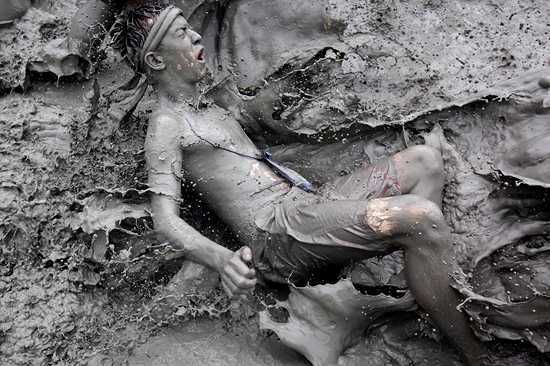 Taking place every summer in the town of Boryeong, South Korea this international mud fight attracts millions of visitors from all over the world. Strangely enough it was originally intended to be a marketing vehicle for local cosmetics producers who use the mineral rich mud in their products. By this point you’ve proably noticed that large groups of celebrating people have a tendency to throw/smear things on one another and while it’s hard to say whether colored powder feels any better than mud or tomatos it certainly looks a lot cooler. 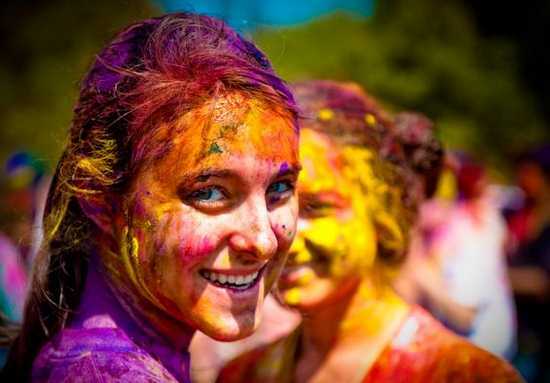 If this kind of thing strikes your fancy though, you might want to pay India a visit during the springtime festival of Holi. At the very least you’ll probably end up with a pretty cool looking tie-dye shirt! There aren’t many things cooler than hanging out with a bunch monkeys. except maybe hanging out with a bunch of monkeys stuffing their faces at an all you can eat buffet. That’s exactly what you’ll find, however, if you visit Thailand around the month of November. 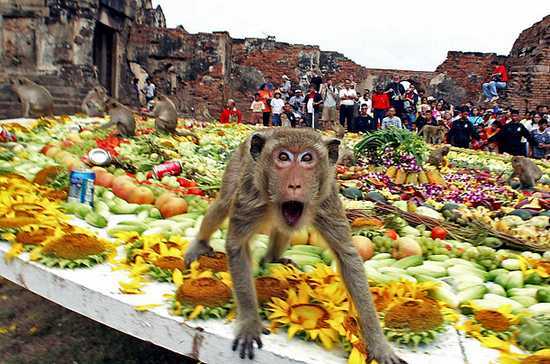 Locals celebrate the festival every year by laying out fruit for their monkey friends. Interestingly enough there’s supposedly no real significance behind it except for an alleged attempt to boost tourism. Where some people ask “why?” the French ask “why not?”. That’s about as good an explanation as your going to get concerning this annual festival held in the small town of Trie Sur Baise. Ok, that’s not completely true. The town used to be France’s biggest pig market and although business isn’t quite what it used to be, it seems the locals are still very passionate about their swine. 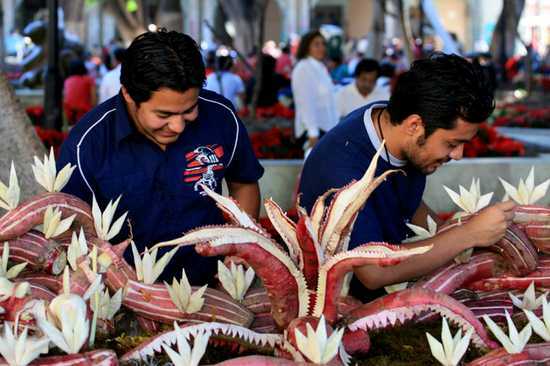 Although it sounds like some sort of vegan horror film, it’s actually a festival celebrated every year before Christmas throughout Mexico. Street side vendors whip out there specially grown, over sized radishes and then proceed to sculpt them into some really cool shapes. 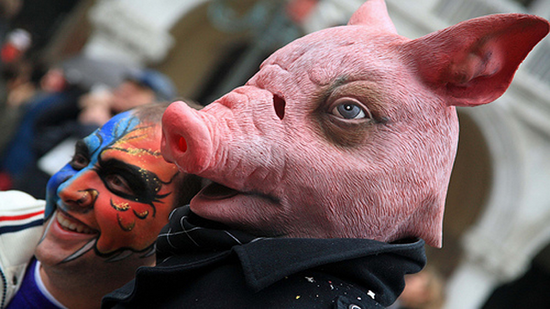 Also known as the Near Death Festival, this celebration is held annually in the town of Las Nieves, Spain. 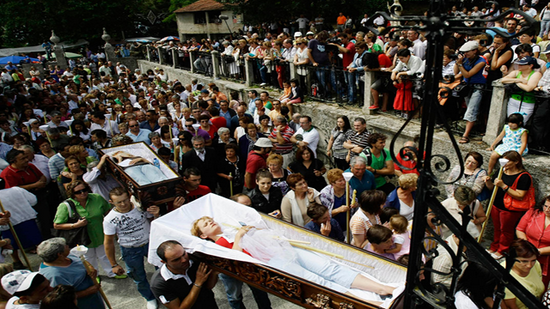 Hundreds of people attend mass in honor of Saint Marta de Ribarteme, the Patron saint of resurrection. Don’t be surprised, however, if you see a bunch of people being carried there in coffins. No, they’re not dead, at least not yet. They’re actually in the coffin because they’ve just had a near death experience in the past 12 months and are now showing their gratitude. 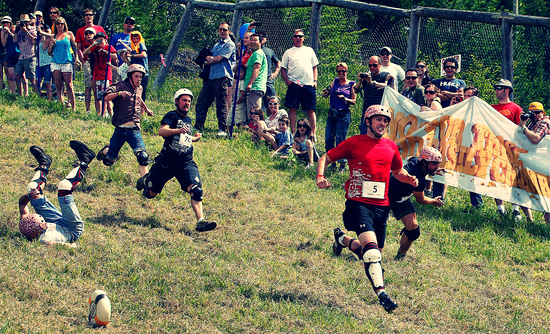 Every year near Gloucester, England hundreds of people gather to watch as locals chase a huge cheese off the top of Cooper’s Hill and tumble a couple hundred yards to the bottom where they are almost inevitably scooped up by paramedics and taken to the hospital. Supposedly if you cross the finish line at the bottom first though, you win the cheese. Definitely worth it. 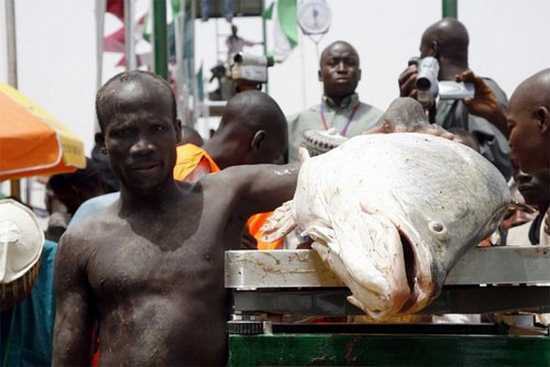 Every year in the town of Argungu, Nigeria all the local men compete to see who can pull the largest fish out of the river using nothing but their bare hands. 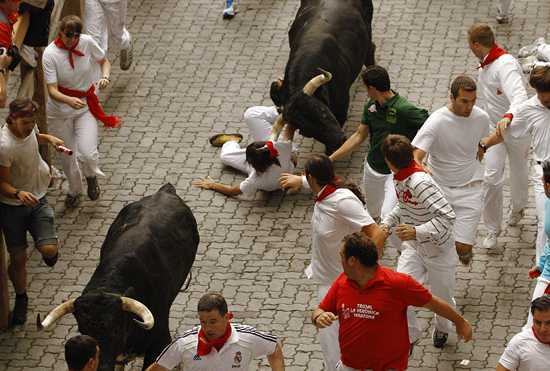 Probably one of the more popular events on this list, the Pamplona Bull Run in Spain is actually part of the Fiesta San Fermin which takes place every July. The only requirements to participate are that you have to be at least 18 years old and sober. When it comes to strange festivals it’s pretty hard to beat the Japanese. 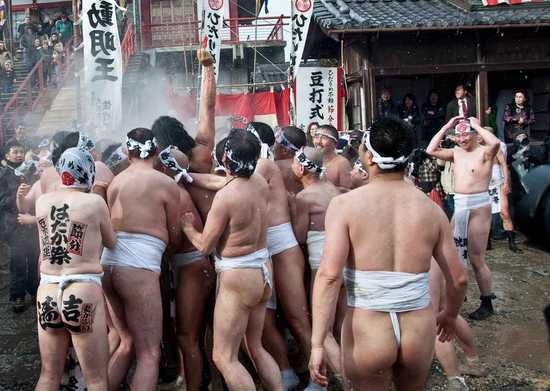 Although this “naked festival” seems like little more than a bunch of guys running around in diapers it’s actually considered to be fairly sacred by some people and can be traced back hundreds of years. 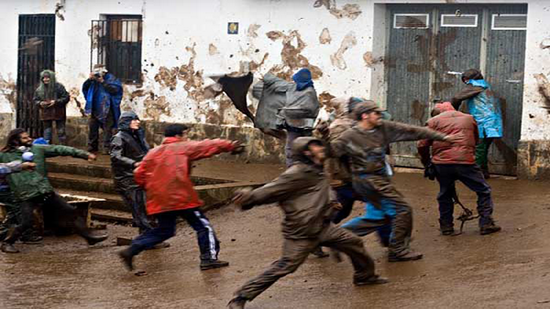 Every year the town of Laza in northern Spain holds a festival that involves people throwing muddy rags at one another. That’s not the worst part though. While everyone is in the town making a mess of themselves several young men will go up into the mountains and collect fire ants. After shoveling them into dirt filled sacks they bring them back to the town where they douse them in vinegar to rile them up a bit. After this the only thing left to do is take the angry fire ants around town and throw them into people’s faces. In celebration of the state’s official animal, the small Alaskan town of Talkeetna holds an annual festival in which the highlight involves dropping loads of moose poop onto targets from hot air balloons. We kid you not. 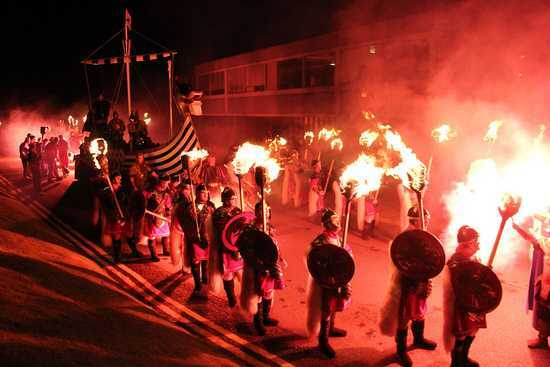 Occurring once a year in the Shetland Islands, Up Helly AA is a fairly intense ordeal that involves lots of fire, viking helmets, and life size replicas of long ships being burnt to the ground or the ocean for that matter. Ever since Bredo Morstol’s body was brought to the United States by his grandson in the late 80′s his body has been cryogenically frozen in a shed located in the small town of Nederland, Colorado. Although initially the townspeople were opposed to the idea of keeping frozen dead people in their backyards, they’ve chilled out quite a bit. 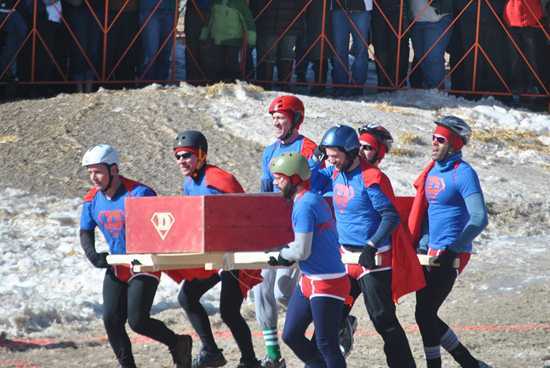 Today they even hold an annual festival that includes coffin races, a slow motion parade, and a Frozen Dead Guy lookalike contest. Each year on Shrove Tuesday in various towns throughout Germany and the Netherlands villagers take part in a very old and very controversial activity. Basically a goose is hung from either a wire or a pole after which participants take turns trying to pull its head off. Of course, the head can only take so much and before long somebody is successful. Don’t get too worked up though, the animal rights activists already beat you to it. These days only dead geese are allowed to be used in the festivities. In 1996 when the Olympics were held in Atlanta, some locals took offense to the fact that the international media portrayed them as a “bunch of rednecks holding a sporting event.” As a result they ended up doing just that. 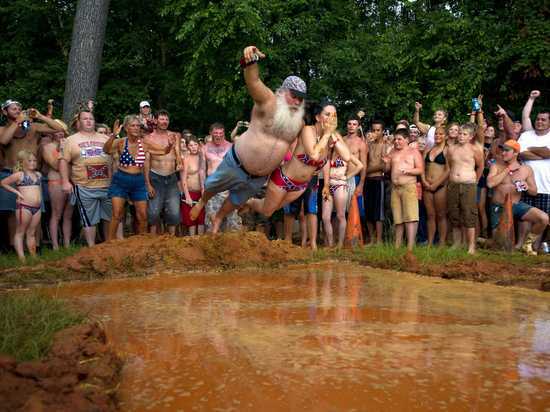 Some of the events include toilet seat throwing, hubcap hurling, and the armpit serenade. 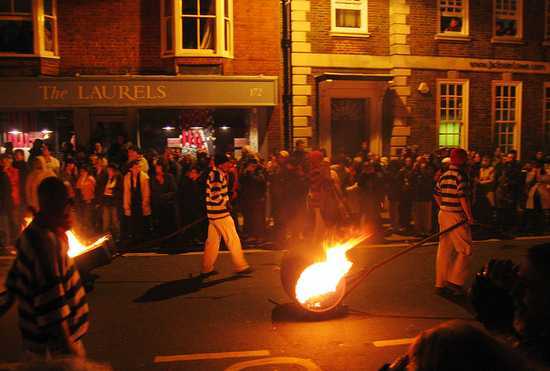 Although no is quite sure why anymore, for hundreds of years people in the town of Devon, England have been running through the streets carrying burning battles of tar. As soon as the sun goes down on the 5th of November barrels are lit and placed upon the back of a carrier. When he can bear it no more he’ll hand off the load to the next willing soul and so and so forth. Staying on the topic of fire, this festival takes us halfway around the world to San Salvador. Around the turn of the 20th century a volcano almost completely destroyed the small town of Nejapa. 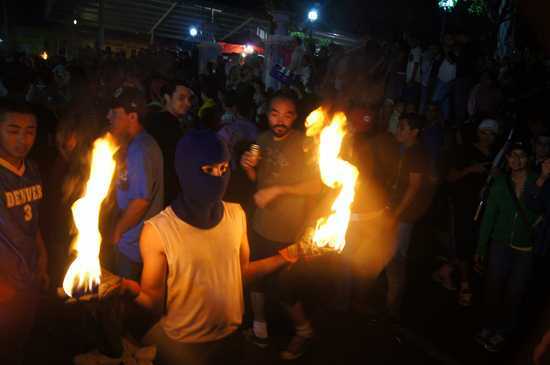 Every year since then residents have gathered together in the town square for very a appropriately themed celebration consisting of throwing flaming rags at one another. Once again we find ourselves in Japan, and once again the Japanese have managed to out do themselves. This time the festival involves two things – sumo wrestlers and lots and lots of babies. Every April the wrestlers face off while holding the babies to see who’s will cry first. May the man with the most baby friendly hands win. There are few things in the world stranger than what happens in the small Spanish town of Manganeses de la Polvorosa every fourth Sunday of January. 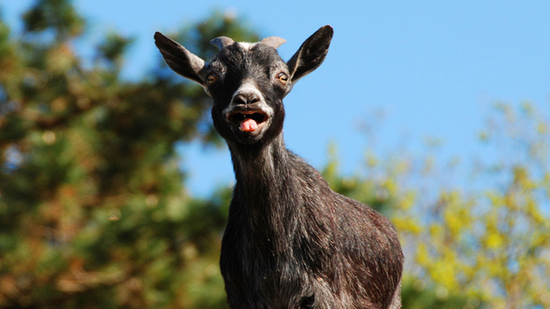 Essentially it consists of a young boy finding a goat, tying it up, and then throwing it from the top of the church belfry after which is supposedly caught by villagers on the ground. 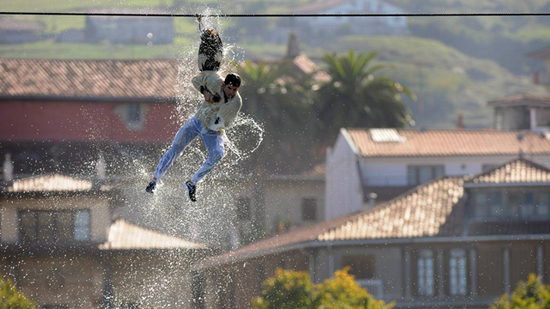 Also known as the baby jumping festival, this cringe worthy celebration occurs every year on the feast of Corpus Christi in the Spanish village of Castrillo de Murcia. 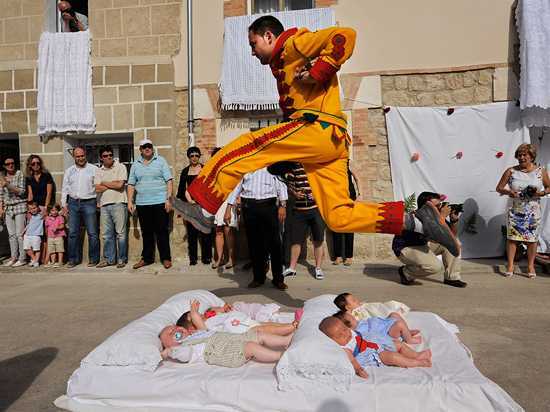 Any baby that was born in the previous 12 months is placed on a mattress in the street while all the adult men of the village take turns jumping over them. Although there are usually at least several injuries, word has it that they typically only involve the jumpers.